The Russian public reacted sharply to the results of the 4 December parliamentary election. Although the ruling party’s share of the vote dropped from 64.3% at the last election (2007) to 49.3%, a significant section of Russian society has no faith in this result. The internet was the chief means of disseminating discontent during the election campaign, and the same is true now. As soon as the results were announced, the internet started bristling with information about falsifications and vote rigging. The most popular news items are eyewitness accounts, video footage and analysis of the official sources of information. Immediately after the election, for instance, government media outlets published the results of the exit polls: in Moscow ‘United Russia’ received 25-27% of the vote, but the official figure was 46.6%. Some internet users go even further, offering their readers complicated statistical analysis of the official figures for turnout and votes counted, proving that there was falsification. The Russian-language section of LiveJournal has never seen so many graphs and diagrams as there were after 4 December. The Russian blogosphere was extremely critical of the regime before the election too. After the 2007 election many bloggers posted comments about vote rigging, but these went unnoticed by most of the population. The triumph of the political internet in Russia is not that it has created a forum for the discussion of important questions, but that – for the first time in the country’s history – this forum is now accessible to a mass of people who previously used the internet chiefly for entertainment. This process started during the election campaign. Most people learnt from the internet that the only way of changing anything at an election controlled by the authorities is to vote for any party other than ‘United Russia’, ignoring the obvious failings of the other parties. The campaign of ‘For any other party’, which was supported by the blogosphere and internet media outlets, including slon.ru and gazeta.ru, was launched by blogger Alexei Navalny. The ‘United Russia’ fiasco on 4 December demonstrates that his was the right strategy. The internet has gained people’s confidence and become a channel for mass reaction to the outcome of the election. The blogs and social networks have got political protest out on to the streets of Russian cities. Essentially the authorities have fallen into a trap of their own making. Since 2007 they have made colossal efforts to dismantle the system of election observers, which was in operation at the beginning of the 00s. In 2003 some of the ‘legal opposition’ parties had carried out vote recounts to monitor the results; in 2011 they were deprived of the funds to enable them to do this. Indeed, they made no particular efforts in that direction, correctly surmising that this kind of activity would attract unwelcome attention from the authorities, providing them with an excuse to impose sanctions. The Moscow rally on Dec. 10th passed a resolution which demanded release of political prisoners, annulment of the fraudulent election results and registration of opposition parties. In a post on his Facebook page, president Dmitry Medvedev dismissed the demonstrators’ complaints, but said he has also called for an investigation into last week's the parliamentary elections last week. How thorough such an investigation will be remains to be seen. Civic organisations like the ‘Golos’ Association are officially banned from sending observers to federal elections and all their attempts to circumvent this ban were fairly effectively blocked by the authorities. In 2008 St Petersburg’s European University was (temporarily) shut down because it had attempted to run an EU-funded training programme for observers. It is well known that the Central Electoral Committee was strongly opposed to delegations of impartial international observers, preferring instead the Russian GONGO (Government-operated NGOs), which have no authority whatsoever with the public, and international observers from CIS countries, whose own elections are not unlike Russian elections in that they fall short of the standards in democratic countries. The whole system worked well while the majority of the population trusted the regime and had no alternative sources of information. But 2011 has been different: in the absence of independent data of any kind about the real voting results, most people have no faith whatever in the authorities. A view commonly circulating in the internet is that ‘United Russia’ actually won no votes at all, or at the very least 20-25% less than the official figures. These views are probably exaggerated, but the authorities are unable to refute them by quoting their own figures. They only have the official results, which are believed by no one. As many Russians, especially in the big cities, did indeed vote for the ‘legal opposition’, they incline to the view that their votes have been stolen, which they find intensely annoying and which, in turn, leads them to protest. This mood of protest has spread via the internet to many people who were previously uninterested in politics and would never have dreamed of shouting about their discontent on the streets. Now street protests have become a reality in Russia. 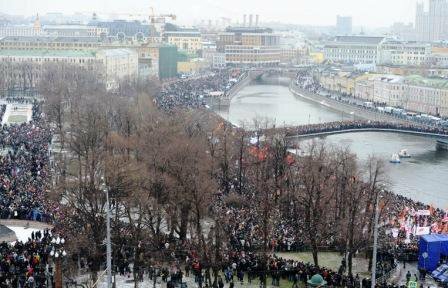 The very day after the election, 5 December, there was a demonstration in Moscow, attended by several thousand people. 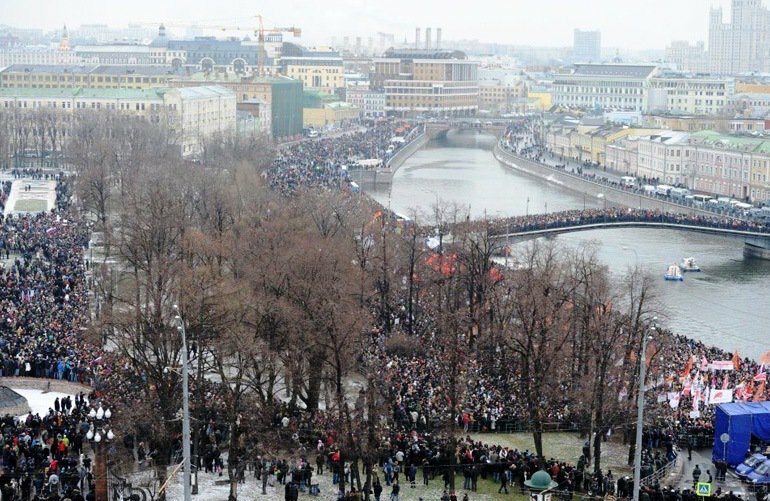 The protest then spread to other cities, chiefly St Petersburg. The regime reacted quite sharply: 1000-1500 people were arrested in the week after the election and some of them (including Alexei Navalny) were given short prison sentences. Large numbers of police and heavy military equipment were brought into Moscow. The peak of the mass protests came with the demonstrations on 10 December. Estimates of the numbers attending the Moscow rally vary, but the real figures are obviously in the region of 50,000, which makes it the largest mass political event in the city since 1993. Mobilisation was mainly via the social network sites Facebook and Vkontakte, and the blogosphere. Many commentators expressed their scepticism at the efficacy of this means of mobilisation, observing that social network users had previously reacted positively to calls to attend demonstrations, and then not turned up. But the situation has changed and, here too, the role of the internet was decisive. If truth be told, the organisers of the demonstration (one of the most crucial of whom was Boris Nemtsov) played only a minor part. They obtained permission for the demonstration from the Moscow authorities and put together the list of speakers. This included the leaders of the un-registered PARNAS or Party of National Freedom (Nemtsov himself, Mikhail Kasyanov and Vladimir Ryzhkov), and of some little-known civic organisations, as well as figures from the world of culture, the press and show business. Unsurprisingly, most of the speeches at the demonstration were predominantly emotional: the concrete proposals, formulated by the organisers and approved by the participants, consisted mainly of annulling the election results and holding a new election to include candidates from non-registered parties. These demands will obviously be ignored by the authorities. It would, of course, be native to expect the result of the Moscow demonstration to be in any way on a par with the Maidan in Kiev or Tahrir Square in Cairo. Figures quoted in the press show that about 50,000 well-armed police officers were brought in to the meeting to ‘keep the peace’ i.e. one for every demonstrator. But they didn’t set about breaking up the meeting and the demonstrators gave them no cause for so doing. This does not mean, however, that more could not have been achieved. An important result might have been a coalition of opposition forces, which could have been tasked with putting further demands to the authorities. The demands themselves could have been more extensive and more serious than simply annulling the results of the election. But this didn’t happen, because the organisation of the demonstration was monopolised by one group, whose role during the election campaign had not been simply below the radar, but actually counter-productive. The leaders of the Party of National Freedom appealed to their voters to spoil their ballot papers, thus rendering them invalid. Had this advice been followed, ‘United Russia’ would have won an overwhelming majority in parliament with as little as 49% of the vote. The demonstration was attended by representatives of the ‘legal opposition’ parties: the Communists, ‘Just Russia’ and Yabloko. The first two of these parties ended up in an ambiguous position because the mood of the demonstration pushed their leaders to state in their speeches that the election results had been rigged. Hardly surprising, then, that they were greeted with calls of ‘Refuse to take your seat!’ but these two parties are very unlikely to turn down the possibility of representation in the new parliament. For Yabloko it was simpler: having failed to pass the 7% electoral threshold set for federal elections, it had no problems calling for the results of the election to be annulled. Interestingly, however, Yabloko is not demanding that the regional election results be reviewed in St Petersburg, where it did actually manage to pass the threshold. Thus the political crisis resulting from the 4 December election has also thrown light on a crisis in the leadership of the opposition. Society has demonstrated a reasonably high level of political maturity and self-organisation, but the opposition has shown itself incapable of exploiting the new conditions to make a practical move one step nearer democracy. The ‘illegal opposition’ remains split and divided by bickering among the various leaders, none of whom have a strong support base in society and some of whom are weighed down by the legacy of their role in Russian politics of the 90s. This legacy is on the whole negatively regarded by society. As was only to be expected, the legal opposition’s main priority is to survive in the authoritarian system, rather than fighting it. The current state of the Russian opposition is, of course, less a function of its own failings, than of the many years of efforts by the authorities aimed solely at reducing the opposition to its present lamentable state. All this makes it difficult to suppose that what is going on in Russia at this moment will bring about any profound changes, though this is no way diminishes the colossal significance of the fact that Russians have woken up and are very dissatisfied with the current state of events. This is the main lesson to be drawn from events in Russia by the general public and politicians in other countries. For a long time many of the analysts who defended Western cooperation with the Putin regime have comforted the public with the thought that Putin, though not an ideal democrat, has the support of his people. This myth has now been blown out of the water. The 2011 model of the Putin regime is not only dictatorial, corrupt and inefficient – it is deeply unpopular.